My Story Divided Part 3: My First Full Blown Manic Episode I actually don’t remember a lot about this episode and this is common with mania. Another thing that happens is that I get different manic episodes confused with other ones. However, I will tell you what I know and or remember. I was 17 years old. I had not been sleeping and was doing odd things. My parents were concerned. So, my mom gave me several benadryl to get me to sleep. My great aunt was a nurse practitioner on a psychiatric floor at a local hospital. My parents contacted her to see what they should do. I eventually ended up at my friend Brian’s house. I met Brian in the group set up by the psychiatrist for teens that were struggling. We had been friends for almost three years. I was over at his house and my parents received a call from him saying that they needed to come get me. I was doing odd things with his mom’s heating system and with water and he was afraid that I was going to damage the house. He also was scared as I was just overall acting very strangely. I remember thinking that I was cleansing the world. I don’t remember exactly what I was using, but I think it was some kind of soap with a lavender smell to it. What I was doing was irrational and so was what I was thinking. I thought by cleaning his house and allowing there to be a circular pattern throughout it, that it would keep it going throughout the world and we would have a planet free of pollution. I don’t remember my parents getting there or the trip to the hospital. I do remember sitting in the ER and seeing my math teacher who was doing janitorial work at the hospital to earn extra money. I remember being what I would learn later to be very manic. I vaguely remember being given a shot and then I woke up in a psychiatric hospital. I later learned that I had had a manic episode. My doctor, Dr. Rich, told my parents and me that I had bipolar disorder. I had no idea what that was and little did I know that over 25 years later I still battle the disease every day. I was in the ICU part of the psychiatric hospital just to give you an idea of how bad I was. My roommate was an elderly lady and had problems of her own of course, but we did create a bond. I actually still have a ring she gave me. However, I was told that I was going into other patient’s rooms. I think there were only 5-6 rooms. Across the hallway from my room was a woman who kept having epileptic seizures. I showered a lot and that was something that concerned the staff. I also was so confused regarding my clothes, that I was only allowed two outfits. I remember a very friendly nurse who would listen and sincerely care. I can’t say that the others weren’t caring, I just know she was. She had blonde hair and her name was Kathie. I remember standing by one of the locked doors that had a small window and watching out it. I don’t think I wanted to go out there, but I remember the door was near a corner. I could watch people from the psychiatric hospital who were not in the ICU go by in each direction. Eventually, I was released to that part of the hospital. I was in the adult’s section. 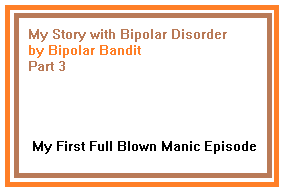 Back then, bipolar disorder was not a diagnosis that was common in people the age of 17. I remember wanting to eat all the time. There was a food station we could help ourselves to and I was constantly making sandwiches. Now that I was in the “normal” part of the psychiatric hospital, I was able to attend church services. I don’t remember very much about this part of my hospital stay. I don’t remember group sessions or really anything of significance. I do remember a few times seeing my psychiatrist. This entry was posted in Uncategorized and tagged disoriented, extreme mania, full blown manic episode, mania, manic, psychiatric hospital, psychiatrist. Bookmark the permalink. I was diagnosed at 17, too, about 10 years ago. I remember wanting to change the world, too, by embarrassing means. Thanks for sharing your story.